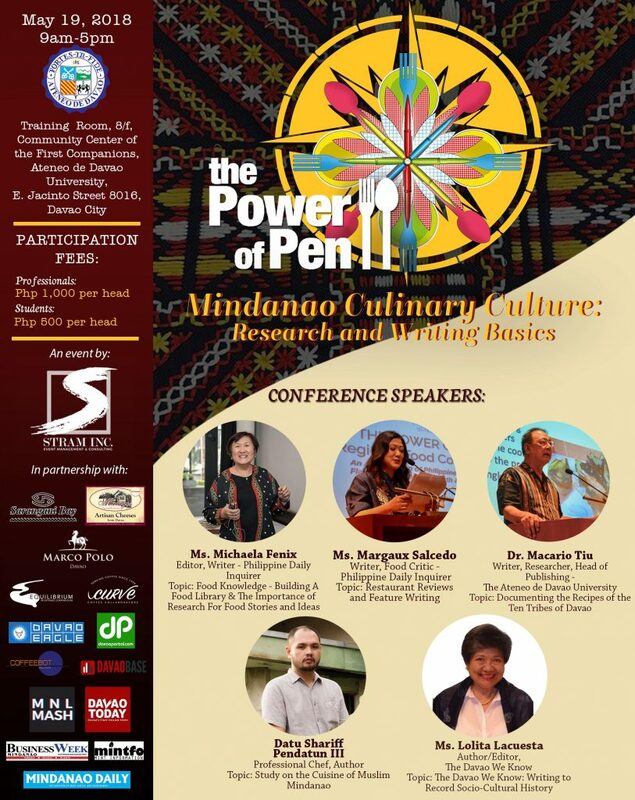 Davao City, Philippines— The Power of Pen (a food writing conference and forum) finally reaches Mindanao. 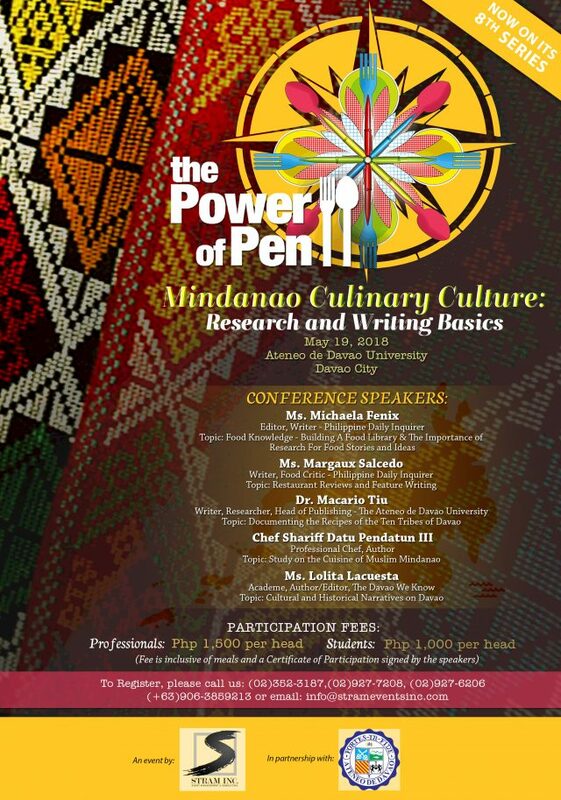 On it´s 8th initiation, entitled with “the Power of Pen 8: Mindanao Culinary Culture-­­ Research and Writing Basics”, the scholastic event itself excites food critiques, marketing professionals, social media influencers, and others to cultivate their writing ability and broaden their knowledge in the gastronomical aspect of the Philippines —particularly in Mindanao, for the Mindanao-an attendees. The Philippines, known for its rich resources, history and culture, has indeed a lot of things to be proud of; one of which is its own culinary specialty. This, however, is not quite seen because of its default purpose. Only a few, and those who originate in a particular culture can only appreciate their own culinary style, and a handful of people can only write a credible and finical review or critique of an experienced cuisine. Since the first initiation of STRAM, INCORPORATED (an events company based in Manila) to organize the Power of Pen —a food writing conference and forum focused on the featuring the gastronomical aspect of the country, also started on 2009), the communication of particular culinary experiences through literary works became strong and popular. It has grown continuously and became an undeniable necessity for writers and professionals in the Philippines –especially to researchers and food critiques. and several topics like Food Knowledge & The Importance of Research for Food Stories and Ideas, Feature Writing, writing Restaurant Reviews. Forward to the event, the seminar has a participation fee of P1000.00 for Professionals and P500.00 for Students and open to everyone who is willing to join. With the presence of the prominent and esteemed speakers, the experience is more than what its monetary worth. Join the Power of Pen this coming May 19, 2018, at the Training Room, 8F, Community Center of the First Companion, Ateneo De Davao University, E Jacinto St., Davao City. The 8-hour seminar will start from 9 AM to 5 PM. To join the revolution and to take part in sharing the significant culinary experience in an enriched literary way, just fill up the form through http://bit.ly/2FSxAFX. Go and take delight in its relishing ideas and discussions on both literary gastronomic explorations. For more information, you may visit their Facebook site at www.facebook.com/strameventsinc or their website at www.strameventsinc.com. You may also call them through 927-­­7208 or 0906-­­3859213.